The Business League does a combination of 3 and 4 and we have specific member only events that are 2. So, for category 4, do you think a speaker makes or breaks the event? We have run events with amazing speakers, and the overall event hasn’t been that great, we’ve had speakers that people didn’t think would be that great and they were amazing. I think for some speaker events there are some really important things you need to consider. One, of them is, have you ever been to a networking breakfast where they had a guest speaker? You waited outside the room not being let in until the breakfast started. It was difficult to meet people, unless you knew them. You got shepherded in to your table. You sit down. Its on a big round table with 10-people on it. You talk to the person next to you either side and maybe, at a stretch, people two down. You might get up to introduce yourself to the other people at the table, but that’s probably all you’ll say to them. The breakfast starts. They talk at you. Then the speaker comes on. They are either good or not. More announcements. And then its time to go and everyone leaves. Summation: Speaker. Met 4-people. Went to work. In this scenario, the speaker is really the whole benefit. So it definitely makes or breaks the event. It’s also important to understand how you gauge a networking event to understand whether the speaker makes or breaks them. If your criteria is about meeting people, then the above example wouldn’t be great for you. If your criteria is based on the speaker, then the above can work for you. I know the structure and facilitator of an event dictates the overall event success or not. Take our breakfast last month. Within the first 10-mintues with the MC doing the intro’s we could sense that the energy was low and if we kept going the whole event would fall over. So we did something different. We got people engaging with themselves, laughing and the energy in the room shifted 180-degrees in 90-seconds. It set the tempo for the rest of the morning. This is where the team running the breakfast is so important. If it’s a one-man band, they may not be in a position to know what’s happening for the audience. If there’s a team they can make sure everything is taken care of. So the team running the event is critical. At The Business League, we are blessed with an amazing team that have been trained to lift the event to make sure its next level every month. We continually improve and adapt. The other aspect that affects whether the speaker makes or breaks an event is how they engage with the audience. Take those events that the speaker talks at you. They can be good. 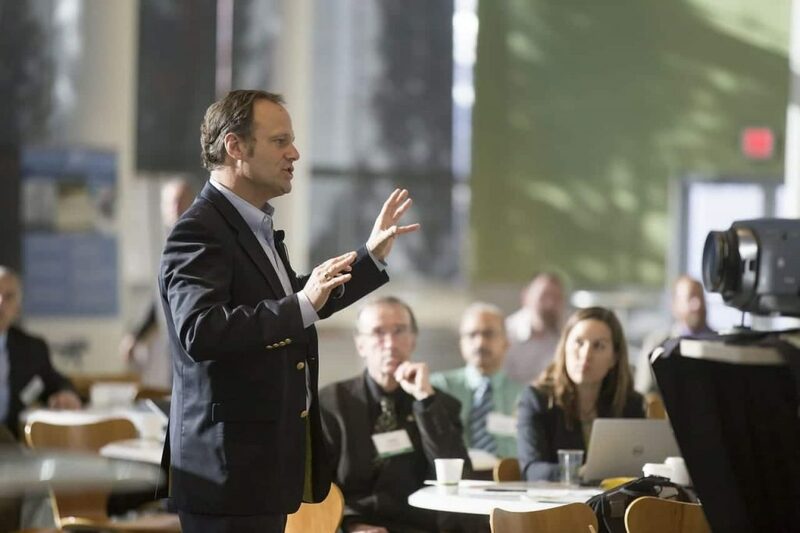 Take the other end of the spectrum, where a speaker is coached to engage with the audience. To be at there level. Where you can actually ask them a question and get a real answer. One in which the speaker is accessible to the audience. Completely different scenarios and styles. You chose which you’d prefer. So, a speaker can definitely make or break an event. That said, it’s the responsibility of the team running it to make sure that isn’t the only factor that affects the overall event success. Over the past 6-years, occasionally we get a speaker that I am underwhelmed with. I’ve got reasonably high standards though as I deal with the speakers every month. The thing is though. For this speaker, so many people loved them and had a great event. One of the factors in this was the structure and team at the event that made it a success despite the speaker. So have you been to an event, in which the speaker made the event? What about broke the event? I’d love to know, send us an email at [email protected] and let me know.